What Are The Benefits Of Single Gear Juicers? Single gear juicers are also known as a masticating juicer. In fact, you are more likely to come across a juicer labelled as a masticator than a single gear. Single gear juicers have several benefits. But first, you need to understand how they work. These juicers work in a similar way to our teeth, in that they ‘chew’ raw foods just like we do! But instead of teeth, they use an auger to grind up vegetables and fruits into a pulp. This pulp is then pressed up against a strainer, so that the juice drains out. The pulp doesn’t get through, instead it stays behind in the strainer and gets ejected out of the machine. Here you can see the Samson 6-in-1 single gear juicer. This is the juicer that I have used for many years with great results. 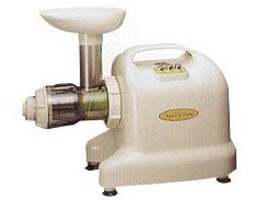 Find more information on the Samson juicer. I love the way the pulp is ejected out of the machine into a separate collection jug. This makes it easy to use in juicer pulp recipes. Compared to other juicers, you will get more juice from these juicers. While centrifugal juicers extract juice by spinning the pulp in a mesh basket, masticating juicers squeeze and strain the pulp, and can get more juice from the same amount of fruits or vegetables. These juicers also run at much lower RPM’s than centrifugal juicers. Why is that important? Because the higher the RPM’s, the more likely you are to get a foamy juice. Foamy juice will oxidize more quickly, and oxidation degrades and destroys the beneficial enzymes in the juice. You can also make more foods in this type of juicer. Many of them will allow you to make your own baby food and nut butters, and even gourmet delights such as pate and sorbet. Can You Juice Leafy Greens? If you want to use sprouts or leafy greens in your juice mixes, make sure that your juicer can handle it…not all of them handle these types of foods well. However, they all generally handle a wide enough variety of raw foods perfectly well. My single gear juicer allows me to juice leafy greens including wheatgrass. If you juice a large amount of raw foods, or juice frequently, a single gear juicer is a good bet for you. Unlike other juicers, you can use a large feed tube and not worry about losing small bits of food down the tube, thereby wasting a bunch of your raw material. You do not have to chop your fruits and veggies into small pieces to use this type of juicer. This makes it quick and easy to use which is essential to me.